When larger Jewish transports were sent to Auschwitz concentration camp in the first half of 1942, the Nazis began using - in addition to the first operational gas chamber - two provisional gas chambers set up in farmhouses whose owners had been evicted from the village of Brzezinka. 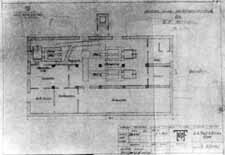 Jewish men, women, and children, as well as Polish political prisoners selected by physicians in the camp hospital, were killed with poison gas in Bunker No. 1, which was also known as "the little red house" (because of its brick walls). The bunker contained two provisional gas chambers. It operated from the early months of 1942 until the spring and summer of 1943, when four new buildings with gas chambers and crematorium furnaces came into use in Birkenau concentration camp. At that time, Bunker No. 1 was demolished and the adjacent burning pits were filled in and landscaped. When larger Jewish transports were sent to Auschwitz concentration camp in the first part of 1942, the Nazis began using - in addition to the first operational gas chamber - two provisional gas chambers set up in farmhouses belonging to people who had been expelled from the village of Brzezinka. 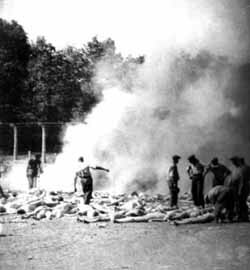 Jewish men, women, and children, as well as Polish political prisoners selected by physicians in the camp hospital, were killed with poison gas in Bunker No. 2, which was also known as "the little white house" (because of the color of the plaster covering its walls). The bunker contained four provisional gas chambers, which operated from 1942 four new buildings with gas chambers and crematorium furnaces came into use in Birkenau concentration camp in the spring and summer of 1943. In the period when the Germans needed additional gas chambers for the destruction of the Jews deported from Hungary in 1944, they temporarily put Bunker No. 2 back into operation. The Crematorium II building, which contained a gas chamber and furnaces for burning corpses. Several hundred thousand Jewish men, women and children were murdered here with poison gas, and their bodies burned. The bodies of Jewish and non-Jewish prisoners who died in the concentration camp were also burned here. According to calculations by the German authorities, 1,440 corpses could be burned in this crematorium every 24 hours. According to the testimony of former prisoners, the figure was higher. 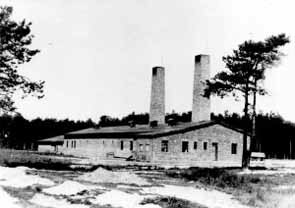 The gas chamber and Crematorium II functioned from March 1943 through November 1944. 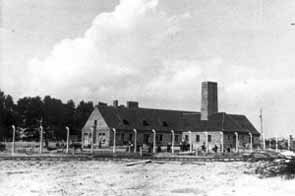 At the end of the war, in connection with the operation intended to remove the evidence of their crimes, the camp authorities ordered the demolition of the furnaces and crematorium building in November 1944. On January 20, 1945, the SS blew up whatever had not been removed. The Crematorium III building, which contained a gas chamber and furnaces for burning corpses. Several hundred thousand Jewish men, women and children were murdered here with poison gas, and their bodies burned. The bodies of Jewish and non-Jewish prisoners who died in the concentration camp were also burned here. According to calculations by the German authorities, 1,440 corpses could be burned in this crematorium every 24 hours. According to the testimony of former prisoners, the figure was higher. 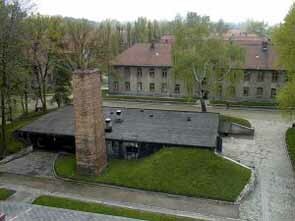 The gas chamber and Crematorium III functioned from June 1943 through November 1944. The Crematorium IV building, which contained a gas chamber and furnaces for burning corpses. Thousands of Jewish men, women and children were murdered here with poison gas, and their bodies burned. The bodies of Jewish and non-Jewish prisoners who died in the concentration camp were also burned here. According to calculations by the German authorities, 768 corpses could be burned in this crematorium every 24 hours. According to the testimony of former prisoners, the figure was higher. The apparatus of mass murder in this building functioned, with interruptions, from March 1943 until October 7, 1944. The building was burned down on the day of the mutiny of the Jewish prisoners from the Sonderkommando. 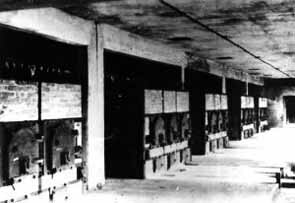 The Crematorium V building contained a gas chamber and furnaces for burning corpses. Thousands of Jewish men, women and children were murdered here with poison gas, and their bodies burned. At times, the bodies of the people who had been murdered were also burned on pyres in pits located near Crematorium V and the so-called bunkers. The apparatus of mass murder in this building functioned, with interruptions, from April 1943 until January 1945. In connection with the operation intended to remove the evidence of their crimes, the SS blew up the building on January 26, 1945.